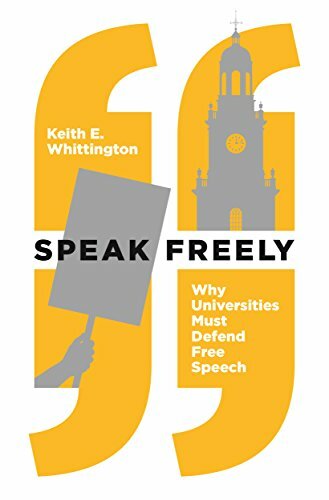 In Speak Freely, Keith Whittington, a professor of politics at Princeton University, defends free speech at colleges and universities, bemoaning that ideological activists, from both left and right, are undermining the core idea of the university as a truth-seeking bastion. The reason d'être of the university is compromised when professors are fired or speakers are disinvited to meet the protestive demands of students, faculty, alums, and donors. Whittington dreams up a campus where students, teachers, and invitees may freely debate controversial ideas without fear of administrative pressure, punitive backlash, loss of benefits, hate mail, crude catcalls, death threats, and huge security costs suffered to protect unpopular speakers invited to campus. Under partisan politics, such a campus is becoming an increasingly far-fetched fantasy. The First Amendment protects free speech in a generously sweeping language: “Congress shall make no law . . . abridging the freedom of speech.” Americans in all walks of life dutifully defend the First Amendment. At the abstract level, the popular commitment to free speech is wide-spread across the states and has been so over the decades. Yet Whittington correctly points out that Americans are unwilling to enforce the First Amendment in favor of specific communities. In the 1950s, for example, they were fine with restricting the speech of Communists. After 9/11, likewise, they are willing to restrict the speech of Muslims. Some liberal campuses have no tolerance for “racist” speakers just as some conservative campuses oppose inviting “anti-American” speakers. Similarly, the rhetoric of “verbal violence” is used in various contexts to argue that even “calm and rational speech” calling for “civility” is violent and that a racist pamphlet is not far off from murder. Thus, words are crafted to censor words. In matters of hate speech, however, Whittington offers a more nuanced commentary. He is willing to exclude from campuses hate speech expressed through “personal invective or racial slurs” that contribute little to the academic enterprise. Yet Whittington argues that university administrators cannot be trusted with the enforcement of any narrow version of hate speech as they are more likely to go overboard in suppressing unpopular and offensive speech that does not qualify to be hate speech. Interestingly, a luminous argument of the book comes across as anti-free speech. Whittington makes a defensible distinction between universities and TV talk shows. A university is a scholarly institution where the mode and language of argumentation are much different from the mode and language at talk shows. Inviting speakers to a university, who will reproduce TV talk, may add much to emotional hurt on campus without contributing value to the academic intellect. Such speakers, if disinvited, will not diminish any pursuit of knowledge at colleges and universities. With remarkable transparency, Whittington exposes the trend how wealthy donors are becoming proactive in suppressing free speech at colleges and universities. He discusses the case of Steven Salaita. A champion of Palestinian rights and a critic of Israel, Salaita received a tenured offer from the University of Illinois at Urbana Champaign. Under pressure from the donors and on the advice of fund-raising staff, Chancellor Phyllis Wise rescinded Salaita’s employment contract. Even though the University settled the case with Salaita and Wise resigned, the net result was nothing but the suppression of free speech. Related to donors’ overreach is the argument that colleges and universities are businesses and not mere academic institutions. Unfortunately, Whittington does not address this point. At all colleges and universities, students pay tuition and incur huge amounts of debt. Private colleges and universities, which receive no state funding, fit the business model more tightly than public universities. But even public universities are subsidized businesses, much like farmers who receive more than $25 billion in subsidies from the government to sustain their farming operations. As businesses, colleges and universities make complex decisions regarding free speech. They do not wish to lose donors who supply monies to sustain and expand programs and academic research. They do not wish to lose students who pay tuition and demand customer satisfaction, part of which might indeed be speech suppression. They do not wish to lose state funding and therefore cannot engage in blatant discrimination. Under these business pressures, conceiving colleges and universities as citadels of truth, as does Whittington, is fanciful. To safeguard business assets, university administrators may stonewall and manipulate the truth in matters of free speech and rationalize their decision-making in bad faith. In controversial cases, what they say to the public may be lies. In the case of Salaita, for example, Chancellor Wise initially hid the truth of donor pressure and focused instead on Salaita’s tweets criticizing Israel and she deemed them “offensive and potentially anti-Semitic.” Only because of the lawsuit was Wise forced to reveal the emails showing the donor demands that Salaita not be hired. The market pressures on colleges and universities might be even more complex than just the influence of donors. A liberal college attracts liberal students just as a conservative college attracts conservative students. A liberal college acting as a business will be foolish to invite a “racist” speaker because it might negatively affect enrollment. Likewise, a conservative college acting as a business will be foolish to invite even a recognized Muslim scholar who might richly contribute to the intellectual discourse. So what is good for the campus intellectually may not be a good business decision. Billions of words have been written to defend the First Amendment, a favored topic for law professors writing law review articles and for students writing seminar papers. Given the exhaustive discourse, it is hard to say something new in defending free speech except to discuss new cases. Yet there is some merit in writing books, such as this, for the public transmitting arguments developed in the academy. Whittington, a non-lawyer, makes a decent effort in recapturing weighty arguments supporting free speech without the burden of legal jargon. Speak Freely is a well-written book that makes an aspirational case for the preservation of an idealized university where the people are tolerant and eager to learn from opponents.